New York, Apr 2nd 2018 - GR Gallery is pleased to present “CHIMERA”, a group show featuring different generations of artists whose works investigate and advance the discourse around colors and patterns, optical illusion, abstract geometry and urban culture. 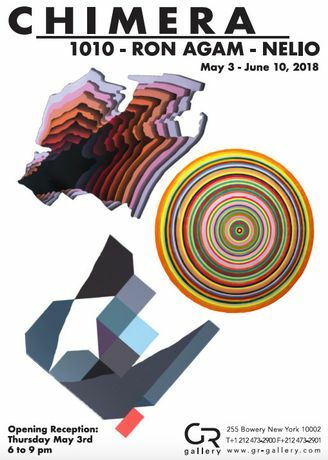 Opening reception: Thursday May 3rd, 6:00pm - 9:00pm (Exhibition Dates: May 3 – June 10, 2018). Members of the press can contact GR gallery in advance to schedule a private viewing and/or an interview with the artists. Artists will be attending the opening night. 1010, (Ten Ten) born in Poland in 1979, he began his artistic career creating contemporary abstract birds and snakes, with some taking on tie-dye and painterly textures with an almost computer generated smoothness. For the past few years 1010 has been mostly focused on an abstract concept of making “holes on the walls”. 1010, is widely recognized for his amazing works that trick the mind to appear like holes and three dimensional shapes. Every piece from his series of op-art murals seem like colorful portals inhabiting the urban and landscape. Layer by layer, 1010 reaches the lightest shades of color, placing them on the periphery of his piece. Nelio (France,1982) Self-taught and vagabond, he has built himself through his many travels that have made him a multidisciplinary visual artist, in perpetual search for learning and experimentation. The style of his debut mainly influenced by his practice of graffiti and graphic design, has slowly evolved into an abstract universe, fruit of the dialogue he develops with the architecture and the surrounding of places that host his creations. He imagines and freezes fragments of a world in perpetual change, creating a feeling of in-between, of unstable equilibrium, where geometric shapes and unstructured lines contrast in interlocking spaces that play with movement and perception.